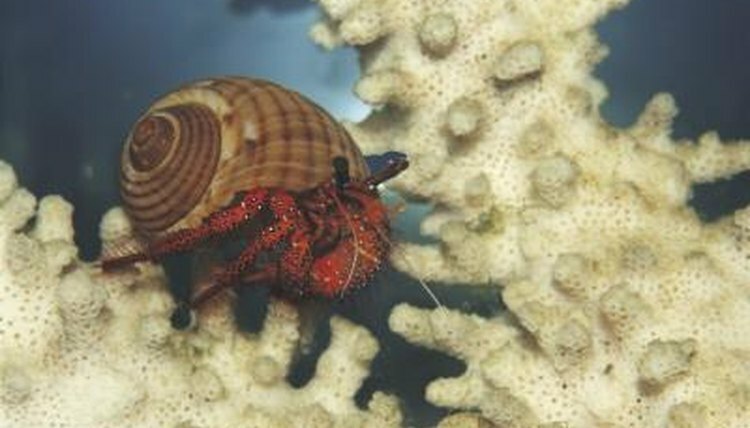 Despite the hard shells that hermit crabs haul around and can retract into when in danger, the little crustaceans face many threats from animals in their environment. Crushing jaws, powerful pincers and shell-dissolving saliva are just a few ways predators remove hermit crabs from their shells and eat them. Hermit crabs can employ a few defensive strategies, however -- including creating an alliance with a toxic anemone. When hermit crabs look around under the water, fish are one type of animal they don't want to see. Many types of fish, including triggerfish, clownfish, porcupinefish, pufferfish and California sheephead, feast on hermit crabs. While fish might not conjure up images of shell-crushing machines, those that prey on hermit crabs have either powerful jaws designed to obliterate a hermit crab's shell or a specialized beak-like mouth able to rip the shell apart. While hermit crabs typically don't have to worry about their own kin preying upon them, other crabs -- the blue crab, in particular -- see them as easy pickings. Using powerful claws that can crush clam shells and tear mollusks right from their shelled enclosure, true crabs make fairly quick work out of the smaller hermit crab. If a hermit crab cannot withdraw completely into its shell -- as is the case if the shell is too small for the hermit crab's body -- a crab can simply pluck the crustacean out. Hermit crabs have few escape strategies when an octopus stares them down, mostly because an octopus has three ways in which it can pull a hermit crab out of its shell and eat it. According to Alaska Pacific University, an octopus can remove a shellfish from its shell by coating the shell in saliva that eats away at the hard exterior. The octopus then essentially drills into the shell with an organ called a radula. Octopuses can also pry shells apart and crush them. While hermit crabs who hang out in the ocean depths aren't at much of a risk of being eaten by birds, those that wash up ashore and hang out on land often catch the eyes of the winged creatures. Sitting out in the open, hermit crabs have limited defense mechanisms to ward off birds. The flying predators simply pluck them right off the ground. To avoid being part of another animal's meal, hermit crabs have a few defense mechanisms they bring to the table. Their shell obviously provides the first layer of defense. While their shells may not deter the aforementioned predators, they do ward off animals who cannot crush or otherwise open them. When threatened, they scurry away or burrow in attempt to outrun predators or hide from them. If grabbed, the appendages of hermit crabs can break off -- they later regrow -- offering them more time to get away. Their best defensive strategy, however, comes in the form of another organism: sea anemones. Anemones and hermit crabs share a symbiotic relationship. The anemone catches a free ride on top of the hermit crab's shell and eats bits of food left behind by the crab. In return, the anemone defends the crab from predators by stinging animals with its poisonous tentacles.